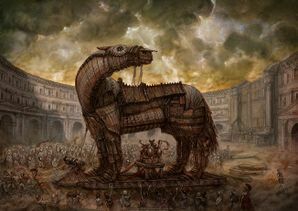 The Trojan Horse (Equus troiam "horse of troy") is a very rare tamable monster in Godville. Trojan Horses are truly Marvels of nature. They are large horse-like creatures whose bodies are completely devoid of organs. They still breathe and eat, but they are hollow on the inside. This allows for easy, but not very comfortable, travel. They are rarely found as pets or near civilization, preferring wide open spaces due to their large size. They are relatively gentle though and aren't known to attack passing travelers. They have been used in war, however. Soldiers have been known to hop inside them (the horse swallows them) and ride inside until at the destination. This allows for easy transport of many troops. Being easy to train, practical, and naturally docile, these are some of the best, but rarest, creatures you can find. The most famous use of a Trojan horse was in Greek history. The Greeks were besieging the city of Troy, and they weren't doing very well. Fortunately, a kind God took pity on them and sent them his hero with his pet horse. The siege was successful and the horse became legendary. 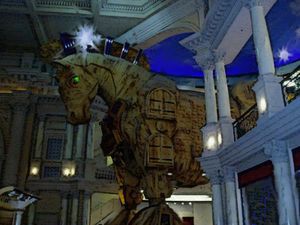 Trojan Horses have also been sighted stealing gold from passing travelers and heroes alike. This page was last edited on 12 March 2019, at 01:09.